The absence of high-resolution epigenomic maps of key kidney cell types has hampered understanding of kidney-specific genome regulation in health and disease. Kidney-associated genetic variants, identified in genome-wide association studies, are concentrated in accessible chromatin regions containing regulatory DNA elements. The authors describe the generation and initial characterization of paired DNA maps of these regulatory regions and gene expression profiles of cells from primary human glomerular and cortex cultures. By integrating analyses of genetic and epigenomic data with genome-wide chromatin conformation data generated from freshly isolated human glomeruli, they physically and functionally connected 42 kidney genetic loci to 46 potential target genes. Applying this approach to other kidney cell types is expected to enhance understanding of genome regulation and its effects on gene expression in kidney disease. Background Linking genetic risk loci identified by genome-wide association studies (GWAS) to their causal genes remains a major challenge. Disease-associated genetic variants are concentrated in regions containing regulatory DNA elements, such as promoters and enhancers. Although researchers have previously published DNA maps of these regulatory regions for kidney tubule cells and glomerular endothelial cells, maps for podocytes and mesangial cells have not been available. Methods We generated regulatory DNA maps (DNase-seq) and paired gene expression profiles (RNA-seq) from primary outgrowth cultures of human glomeruli that were composed mainly of podocytes and mesangial cells. We generated similar datasets from renal cortex cultures, to compare with those of the glomerular cultures. Because regulatory DNA elements can act on target genes across large genomic distances, we also generated a chromatin conformation map from freshly isolated human glomeruli. Results We identified thousands of unique regulatory DNA elements, many located close to transcription factor genes, which the glomerular and cortex samples expressed at different levels. We found that genetic variants associated with kidney diseases (GWAS) and kidney expression quantitative trait loci were enriched in regulatory DNA regions. By combining GWAS, epigenomic, and chromatin conformation data, we functionally annotated 46 kidney disease genes. 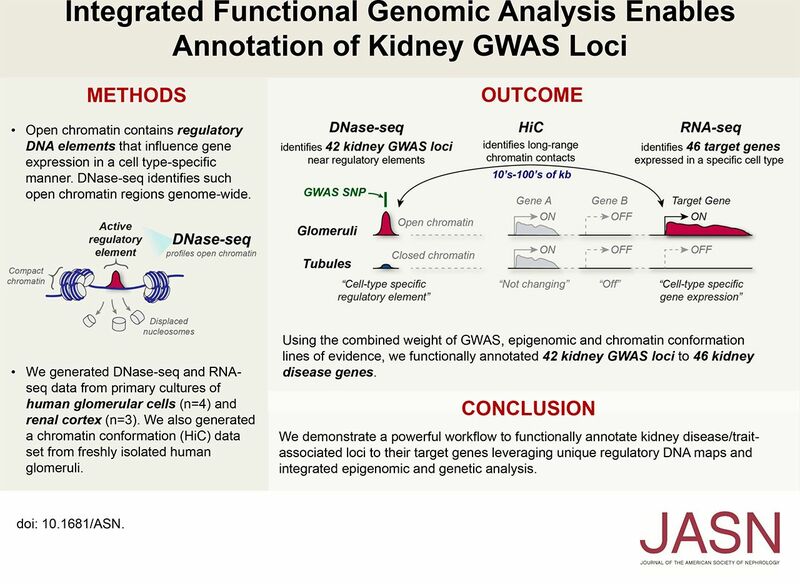 Conclusions We demonstrate a powerful approach to functionally connect kidney disease-/trait–associated loci to their target genes by leveraging unique regulatory DNA maps and integrated epigenomic and genetic analysis. This process can be applied to other kidney cell types and will enhance our understanding of genome regulation and its effects on gene expression in kidney disease.